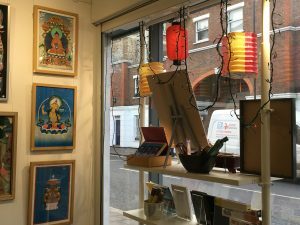 Outside of class times you are welcome to come and browse the books, art and gifts in the shop, look around the shrine room or have an informal discussion about meditation and Buddhism. See below for further information. Classes run from 11am-12noon so please come after this time if you do not wish to attend the class. Classes run from 10.30-11.30 and 11.30-12.30 so please come outside these times if you do not wish to attend the class. 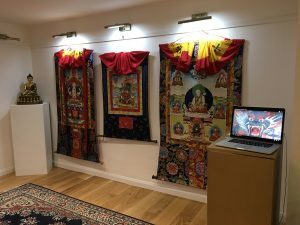 Dechen London Sakya Buddhist Centre has a welcoming reception area with space to sit and have a coffee and a large shrine room and meditation space. 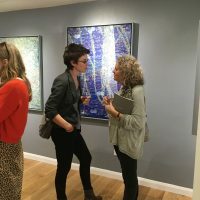 As well as our weekly programme of classes in Buddhism and meditation, the centre also hosts cultural events such as art exhibitions, poetry evenings and book launches. 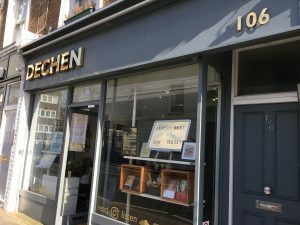 There is a small shop at Dechen London with a unique collection of books on Buddhism and Buddhist cultures as well as a selection from the Western literary tradition. We also stock a selection of traditional Buddhist art as well as prints of original works by Western Buddhist artists. 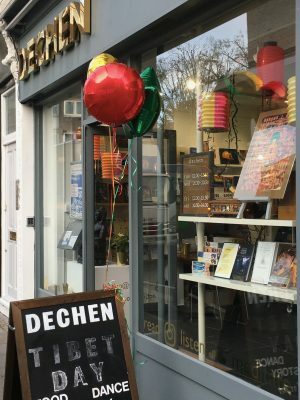 Set on the edge of Notting Hill and not far from the beautiful canal side walk to Little Venice, Dechen London is an oasis of calm and tranquility in the heart of a bustling and vibrant city. The ideal place to sit back, relax and read a book, or attend one of the many regular events on Buddhism, meditation and Buddhist culture. 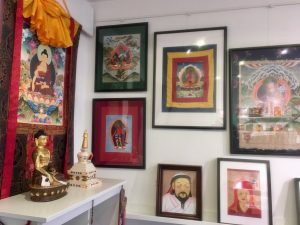 The centre is staffed by volunteers who are also experienced Buddhists and are able to answer any questions you have about Buddhism in general and the Sakya tradition of Tibetan Buddhism in particular. If you have a particular interest or aspect of the teachings you’d like to know more about they will be happy to point you towards reliable sources. Time permitting they may also be able to give you a guided tour of the beautiful Sakya Buddhist Centre shrine room and talk you through a simple meditation technique.